There are 8 Assisted Living Facilities in the Marietta area, with 2 in Marietta and 6 nearby. The average cost of assisted living in Marietta is $3,200 per month. This is lower than the national median of $3,346. Cheaper nearby regions include Parkersburg with an average starting cost of $2,195. To help you with your search, browse the 22 reviews below for assisted living facilities in Marietta. On average, consumers rate assisted living in Marietta 4.5 out of 5 stars. Better rated regions include Ravenswood with an average rating of 4.8 out of 5 stars. Caring.com has helped thousands of families find high-quality senior care. To speak with one of our Family Advisors about assisted living options and costs in Marietta, call (855) 863-8283. Marietta is located right along the Ohio River and is the county seat of Washington County, Ohio. The area has plenty of options for seniors interested in assisted living facilities (ALFs). In fact, there are two in Marietta and another seven in the surrounding area. In Marietta, and the rest of Ohio, ALFs — also known as residential care facilities (RCFs) — are regulated by the Ohio Department of Health (ODH). They are defined as "accommodations for seventeen or more unrelated individuals" who are "dependent on the services of others by reason of age or physical or mental impairment." The cost of living in Marietta is 13 percent lower than the national average, and 4 percent lower than the state of Ohio as a whole. This means seniors can get more on a fixed income, particularly with the low costs of utilities and health care. The Marietta area is home to world-class medical facilities, including Marietta Memorial Hospital, in the event of medical emergencies or illness. Senior residents of Marietta can enjoy getting to experience all four seasons, with summer highs in the 80s and winter temperatures averaging in the 40s. Crime rates in Marietta are approximately 15 percent higher than the state average, which could be a concern for senior residents. However, much of this is due to property crime which isn't a big problem for those living in an assisted living community. The American Lung Association gives Marietta a C rating, which could be problematic for seniors with respiratory issues in the warmer, humid months. Marietta is home to Marietta College, a private liberal arts school, which offers many arts and culture opportunities for seniors. On-campus arts shows and events are often free or offered at a reduced cost for seniors. Assisted Living costs in Marietta start around $3,200 per month on average, while the nationwide average cost of assisted living is $4,000 per month, according to the latest figures from Genworth’s Cost of Care Survey. It’s important to note that assisted living rates in Marietta and the surrounding suburbs can vary widely based on factors such as location, the level of care needed, apartment size and the types of amenities offered at each community. Residents of RCFs in Marietta may be able to get financial help through the Assisted Living Program and Managed Care Demonstration Medicaid waivers. 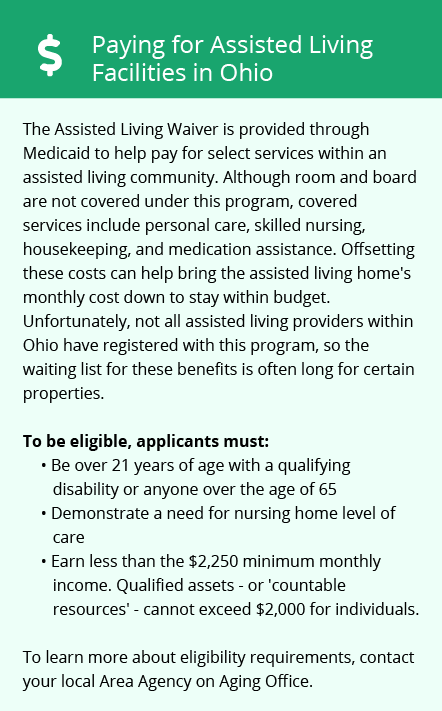 Ohio's Residential State Supplement (ORSS) program also offers cash assistance to certain eligible people. Marietta and the surrounding area are home to numerous government agencies and non-profit organizations offering help for seniors searching for or currently residing in an assisted living community. These organizations can also provide assistance in a number of other eldercare services such as geriatric care management, elder law advice, estate planning, finding home care and health and wellness programs. To see a list of free assisted living resources in Marietta, please visit our Assisted Living in Ohio page. 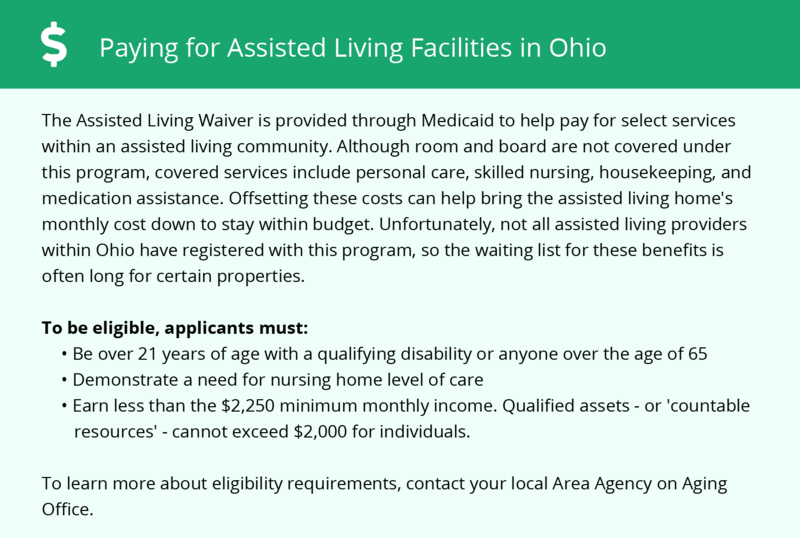 Marietta-area assisted living communities must adhere to the comprehensive set of state laws and regulations that all assisted living communities in Ohio are required to follow. Visit our Assisted Living in Ohio page for more information about these laws.